Did y’all have a Happy Cinco de Mayo? I sure did! 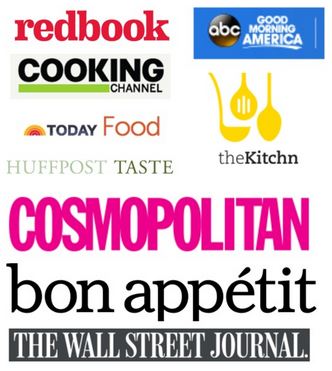 An excuse to nosh on tacos and margaritas?! No wonder it is one of my top five favorite holidays. And that says a lot because I love every holiday. Between that and the Austin Food & Wine Festival shenanigans, I’m pretty darn full! 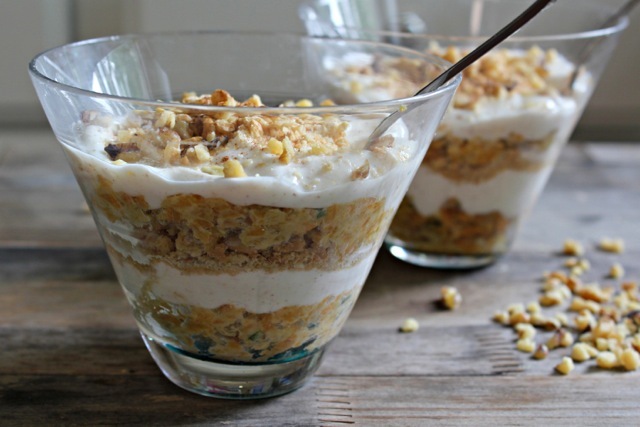 So back to healthy eating this week with this parfait made from my leftover sweet potato kugel! If you don’t have some leftover kugel lying around, this would be pretty tasty with some cinnamon sugary mashed sweet potatoes too. A sneaky way to get some veggies in with breakfast! And if there is one thing I enjoy nearly as much as holidays, it’s being sneaky. You know what else I enjoy? 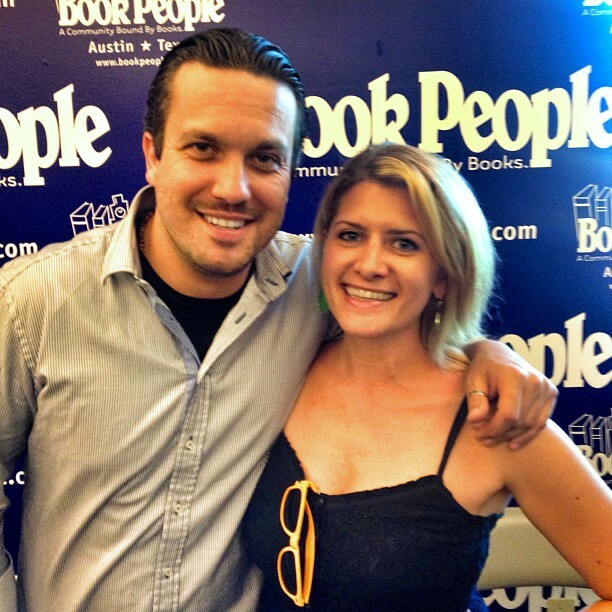 Chatting with adorable celebrity chefs like Fabio Viviani! 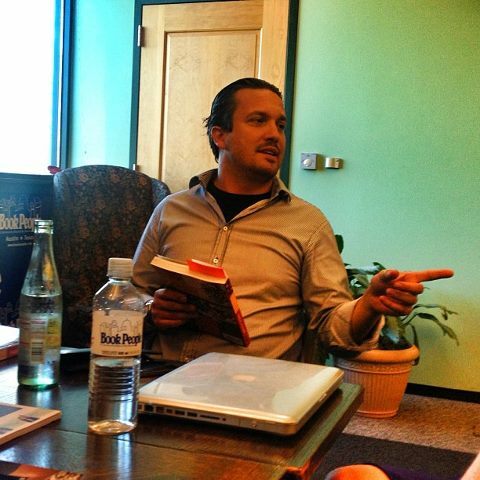 Fabio stopped in Austin to talk about his cookbook Fabio’s Italian Kitchen , which looks absolutely amazing. 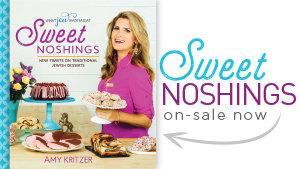 I love how he is sharing his Nonna’s beloved recipes in the book just like I share Bubbe’s on WJWE! Look how much we have in common already. Fabio took the time to speak with a few local bloggers and he is just hysterical! Sigh. 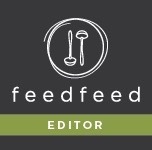 Fabio doesn’t seem too concerned with the meat heavy cookbook: “If you feel bad for the veal, don’t read the veal recipes!” For him, “the joy of eating a ribeye is way more compared to the bothersome of eating a carrot.” Mmm ribeye. We look pretty adorable together right?? Right! Okay, onto the parfait! In one bowl, mash up sweet potato kugels together. In another bowl, mix plain Greek yogurt (I used Chobani), honey, and cinnamon. Scoop about 1/4 of the potato mixture into a glass. 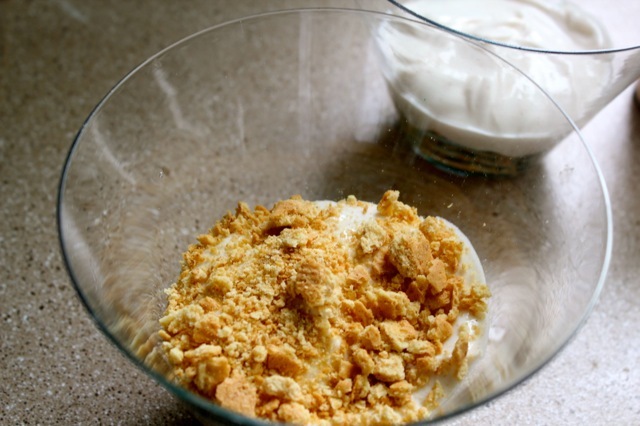 Layer on 1/4 of the yogurt mixture, sprinkle with graham crackers and walnuts. Repeat another layer of each and top with more nuts and cinnamon. Repeat in another glass. That’s it! 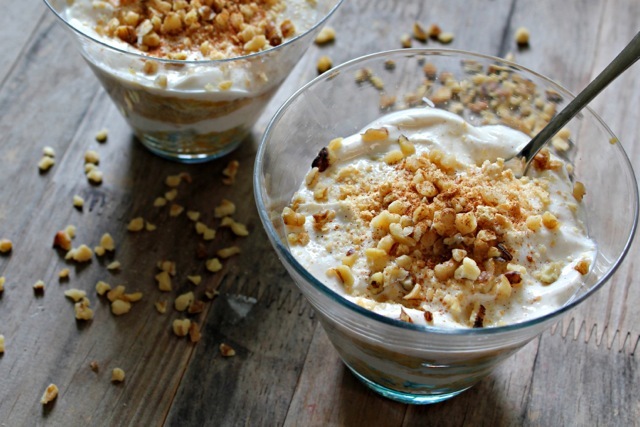 This parfait is smooth yet crunch, really filling, slightly sweet, and chock full of vitamins. Win! 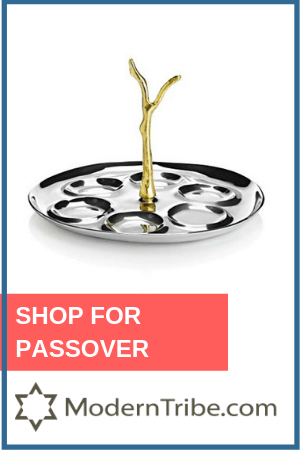 Certainly not your Bubbe’s wheat germ! 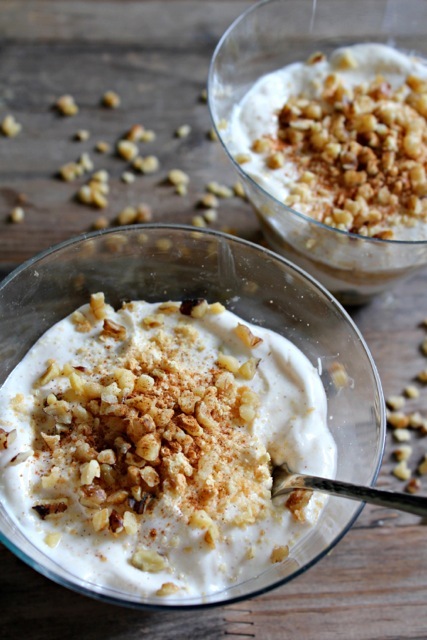 Sweet Potato Kugel Parfait made with Greek yogurt, cinnamon, and crunchy walnuts! In one bowl, mash up sweet potato kugels together. 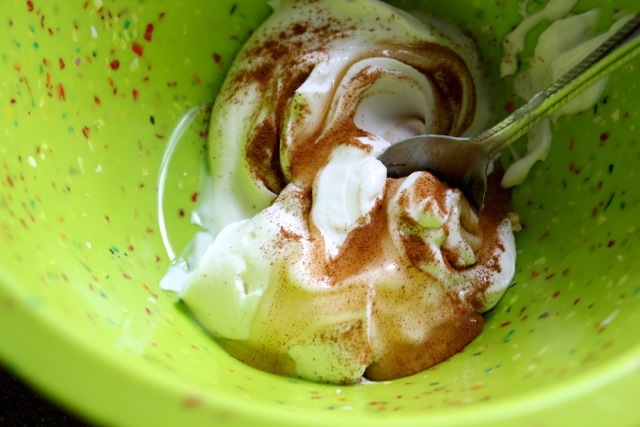 In another bowl, mix plain Greek yogurt (I used Chobani), honey, and cinnamon. Scoop about ¼ of the potato mixture into a glass. 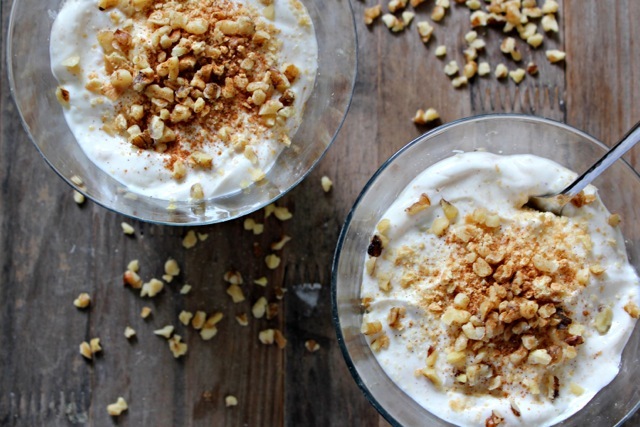 Layer on ¼ of the yogurt mixture, sprinkle with graham crackers and walnuts. Repeat another layer of each and top with more nuts and cinnamon. Repeat in another glass. 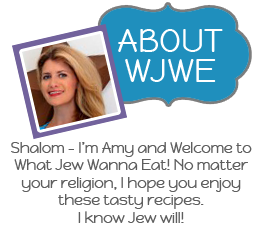 « Saving & Printing Recipes on the New WJWE with ZipList! Oh, you are adorable and I love the new member of our family, Fabio! Mangia!